God has given us guidelines that apply to every aspect of our lives, including our physical, spiritual, and emotional fitness. 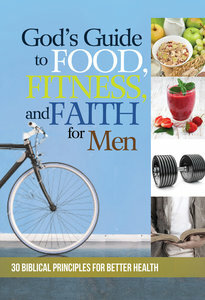 God&'s Guide to Food, Fitness, and Faith for Men explores these guidelines by helping readers focus on key principles for improving their spiritual, emotional and physical health. Filled with uplifting stories, memorable quotes, familiar Bible verses, and action steps, this text provides the information and motivation men need to stay fit and healthy in our temptation-filled world. God&'s Guide to Food, Fitness, and Faith for Men will be a powerful resource for men who sincerely desire to improve themselves, their health, and their lives. About "God's Guide to Food, Fitness, and Faith For Men"